In partnership with the City of Maple Ridge, our weekly curbside recycling pickup service combines the best of door-to-door efficiency with sound environmental principals & practices. Our specially-designed recycling trucks have multiple compartments which help keep the recycling streams separate all the way from curb to manufacturer. 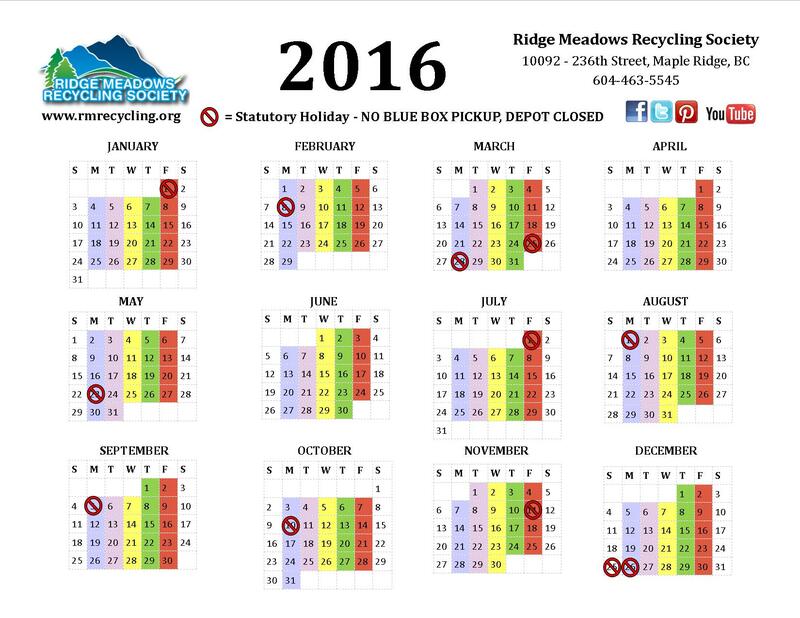 Check out the RMRS Curbside Recycling Pickup Route Map. If you are new to Maple Ridge*, WELCOME! When it comes to taking care of our waste, we do things a little differently here than in other municipalities, hopefully this website will help you understand why. To learn more about the history of recycling in Maple Ridge, take a look at Our History. Maple Ridge strongly believes in a resident-led, multi-sort system. Click to download the pdf RMRS Multi Stream Recycling Position Paper and learn more about why we remain committed to this system. 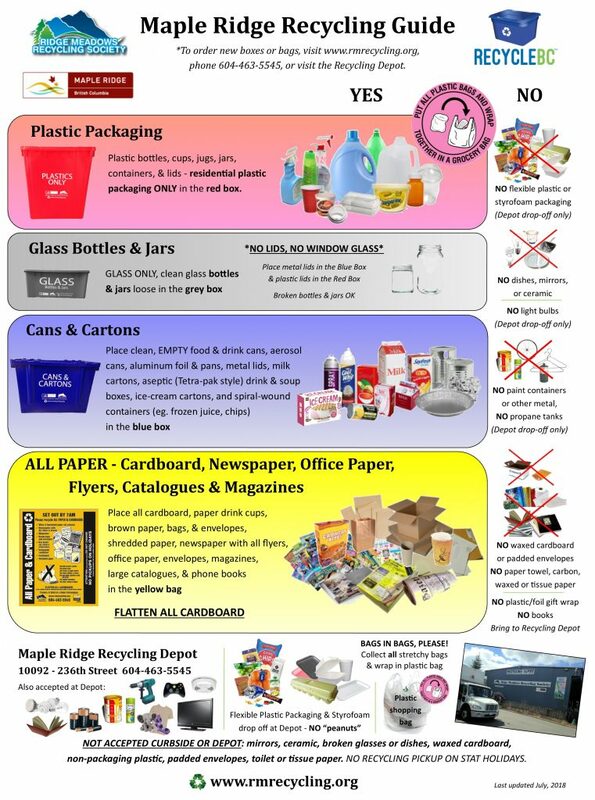 Download the 2018 Curbside Recycling Sort Flyer, showing which box or bag to sort your recyclables into. NOTE: New or replacement boxes & bags are covered in your property taxes. 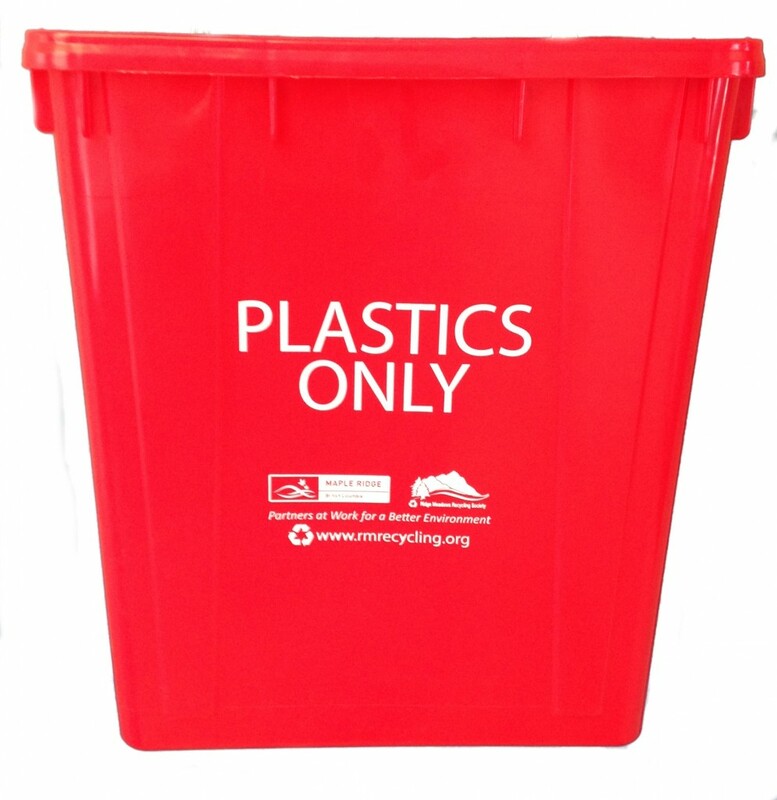 You can pick up new recycling boxes or bags during open hours at the Maple Ridge Recycling Depot or have them delivered to your house by calling 604-463-5545 or ordering them online here. 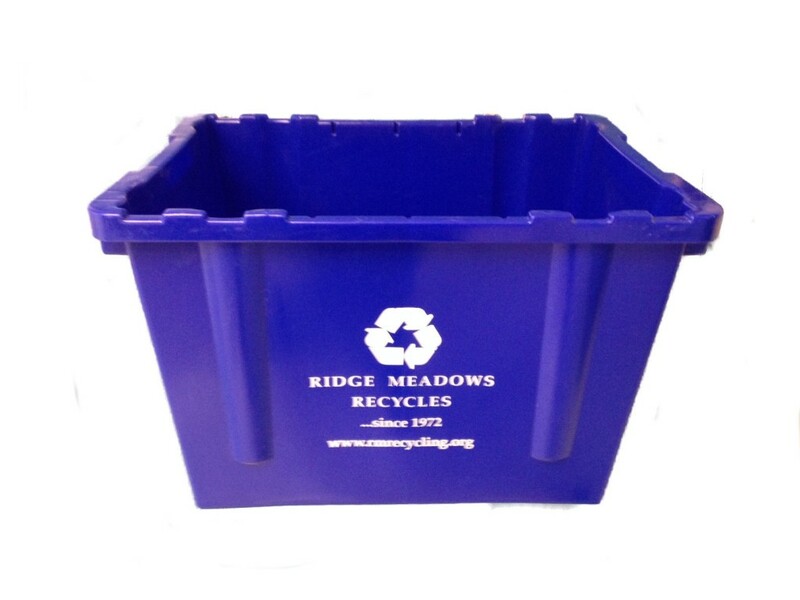 Please place your recycling boxes and bags at the curb by 7:00am on your recycling day. 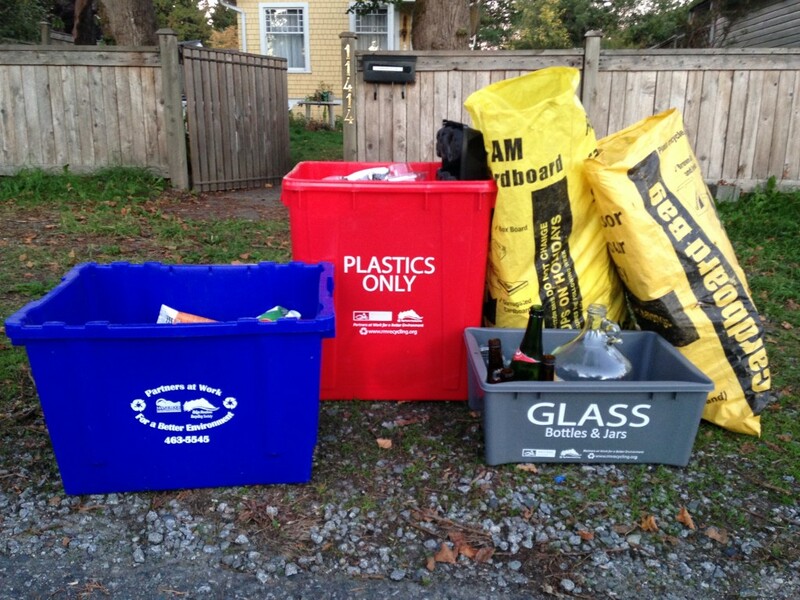 To find out your recycling day, check out our route map, RMRS Curbside Recycling Pickup Routes. 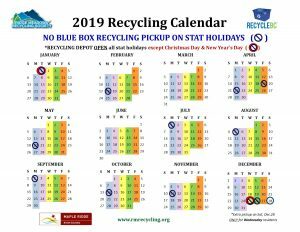 We do not pick up recycling on statutory holidays. 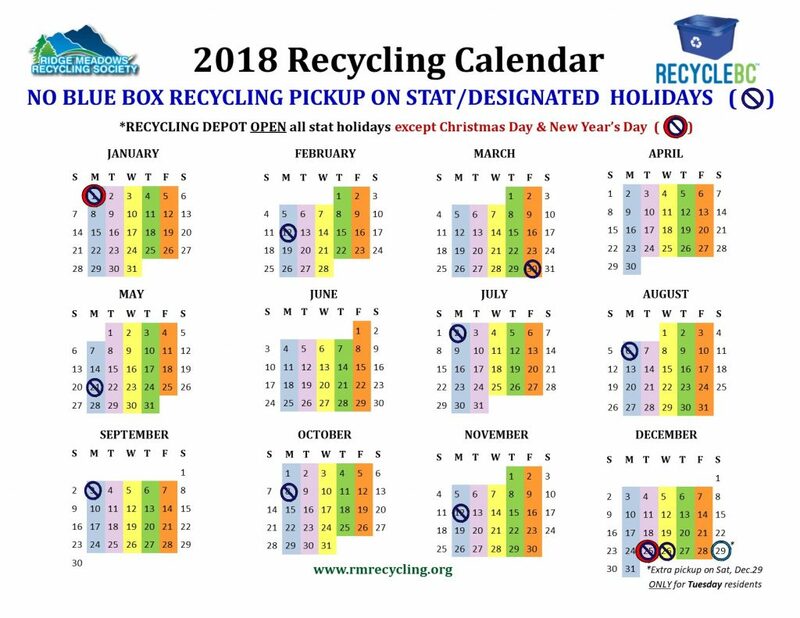 Please save your recycling and set it out the following week. If you have a lot of recycling build up between pickups, you can drop it off during open hours at the Maple Ridge Recycling Depot located at 10092 – 236th Street, Maple Ridge, just off River Road in the Albion Industrial Park. For a full schedule of statutory & designated holidays, see the 2018 Statutory & Designated Holiday Calendar below or download the 2018 RMRS Stat Holiday Blue Box Pickup Schedule or the 2019 RMRS Stat Holiday Blue Box Pickup Schedule.